Home > Relic Entertainment Inc.
Found 2 file extension associations related to Company of Heroes: Tales of Valor and 2 file formats developed specifically for use with Company of Heroes: Tales of Valor. 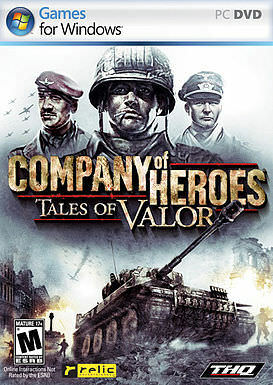 Company of Heroes: Tales of Valor is a stand-alone sequel for the award winning real-time strategy game, Company of Heroes. It was developed by Relic Entertainment and released in 2009. Tales of Valor contains three campaigns based on historical events from World War II. There are a great many stories to be told from the war, and these campaigns each tell a unique and intimate tale that is translated into gripping tactical combat. Tiger Ace is the first of the three campaigns, telling the story of The Battle of Villers Bocage over the course of three scenarios. The battle takes place in France, 1944, as Allied forces stream ashore from the beaches. A British armored column threatens to break through a gap in the German lines, but a fearsome Tiger Tank commanded by a veteran crew races forward to engage them in the town the battle was named after, Villers Bocage. Take Direct Control of your lone Tiger, invest command points in your tank crew to unlock new abilities, fight to keep your crew alive and your unit from being out flanked! If you need more information please contact the developers of Company of Heroes: Tales of Valor (Relic Entertainment Inc.), or check out their product website.